The parkway follows the Appalachian Mountain chain and provides some of the most spectacular scenery in the world, ranging from 650 to 6,000 feet in elevation. 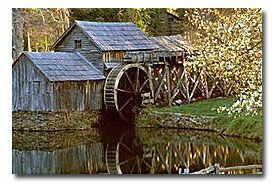 At Milepost 176.1 is Mabry Mill, a restored gristmill/sawmill/ woodworking shop and blacksmith shop. Old time skills (basket weaving, seat caneing, spinning, and weaving) demonstrated. Applebutter making on Sundays in October - Oldtime bluegrass music on Sundays 2:00 - 6:00 p.m.